Simple equation: Melba Ketchum's Bigfoot DNA study definitively argues against Giagantopithecus as Bigfoot ancestor. As we have posted earlier, Ketchum says Erectus is a better model. Below is an excerpt from Robert Lindsays post "Bigfoot News January 20, 2012" The article mentions a possible Erickson Project Movie covered in greater depth by Shawn at BigfootEvidence. Another blow against the Bigfoot is an ape meme. Ketchum has recently changed the description of herself on Twitter. It now says: Scientist, Forensics and Hominid Research (italics ours). Nice! More death knells for the Giganto/Bigfoot is an ape theory. The precursor of Bigfoot is often said by proponents of the Bigfoot is an ape theory to be something called Gigantopithecus, a giant ape that lived in Asia and went extinct about 300,000 years ago. There are several problems with this model. If it went extinct 300,000 YBP, that’s a long time between then and the present day Bigfoots with no fossils in between. No Giganto fossils in the Americas. While Giganto was probably an ape when it was standing on two feet, there is no evidence that it was bipedal, and it was probably not bipedal. After all, the only bipedal apes are in the human line, the hominids. If it’s a bipedal ape, it’s a hominid, not an ape. This is fundamental.Theorists of the Giganto was bipedal line offer the Giganto fossils as evidence for bipedalism, but all we have is a jaw and some teeth. It seems impossible to prove via meager evidence from the mouth of a creature whether it stood upright or not. While some think that Giganto derived from Australopithecines and went on to Meganthropus and then to modern Homo in Asia, this line is tendentious. It’s true that a Bigfoot tooth found by Mike Rugg resembles a Meganthropus tooth. However, Meganthropus is found only in Asia, and while it appears to be Homo Erectus, it also seems to have gone extinct about 1 million years ago.That’s 1 million years between Meganthropus and Bigfoot with no fossils in between. A new theory that I like suggests that Giganto instead is related to Orangutans. If so and if Bigfoot is related to Giganto, Bigfoot DNA should be far away from human, somewhere near the distance of an Orangutan. Instead, Bigfoot DNA is 37% of the way from a human to a chimp. This would mean that it is in the human line and far away from an Orangutan. Now that DNA has shown that Bigfoots are hybrids between a possible Homo Erectus type on one side and Homo sapiens on the other, this means that modern humans mated with Giganto in the last 10-50,000 years. Assuming such mating is even physically possible, it’s almost certain that no viable offspring could derive from mating between a human and an orangutan type.Further, the breeding between relict hominids and humans that produced the Bigfoots seems to have occurred in both Africa and Southern Europe between 10-50,000 years ago, and Giganto is known only from Asia around China and Vietnam (a likely Southeast Asian location for an orangutan derived type) and is not known from Africa or Europe. 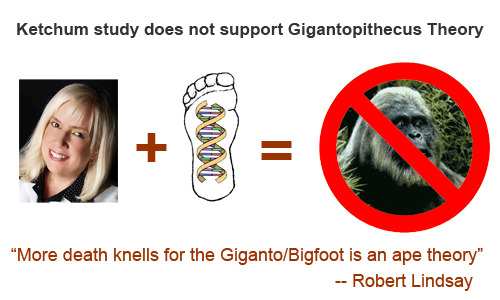 In short, the Bigfoot as Giganto theory seems to have massive problems. Makes a little more sense to me. The origins of these creatures.. remains wide open, and still a mystery. Was never one that jumped on the giganto theory train. The leaks indicate that BFs are part of the homo line, more distant than denisova. If we ever get DNA from Flo, and if Demanisi cave keeps giving up its treasures, then we may conclude that erectus was in Asia much earlier than we think. Maybe it evolved there, from a wandering australopithicine line, and wandered back into Africa as ergaster? I personally hope that Adrian Erickson recovers financially for this. He's been struggling and waited a long time for the DNA results. It's the only way people will believe his film. You have a great point Shawn. It will almost be MORE interesting to see the reaction to the film. The Erickson Project has been floating for too long, allowing too much speculation and debate. I am still curious what kind of relationship was Erickson intending with Todd Standing? Saying that Bigfoot could have no connection to Meganthropus because its fossils are found only in Asia and none seem to be younger than approximately 1 million years old have been found is, quite frankly, asinine. If we compare Bigfoot only to contemporary North American fossils of hominids then we're left only with Amerindians. Having said that, I too doubt the Giganto theory associated with Bigfoot (if they exist at all). Giganto is an orangutan relative. The ancestors of Bigfoot must have come from Asia via the Bering land bridge. To me that kind of migration and wide range makes far more sense in terms of a human relative.